FINALLY!!! FIT ME IS HERE!!! And FitMe! is actually one thing I'm super happy about, because according to murmurs another one of my suuuper awaited Maybelline collections is coming later this year! That's why I'm so excited today to be talking about what went down in the launch! In general, I'm quite happy with how most FMCG's have been going about their regional strategies. The Philippines is perhaps the only super Westernized country in Asia, and as such, we often obey different trends. Right now, the Korean makeup trend is all the rage in the rest of Asia, and people can't get enough of CC Creams, dewy finish products, and gradation lip products. But here, we're all about the Kardashian trend right now with sharp contour and highlight, matte faces and nudy matte lipsticks. 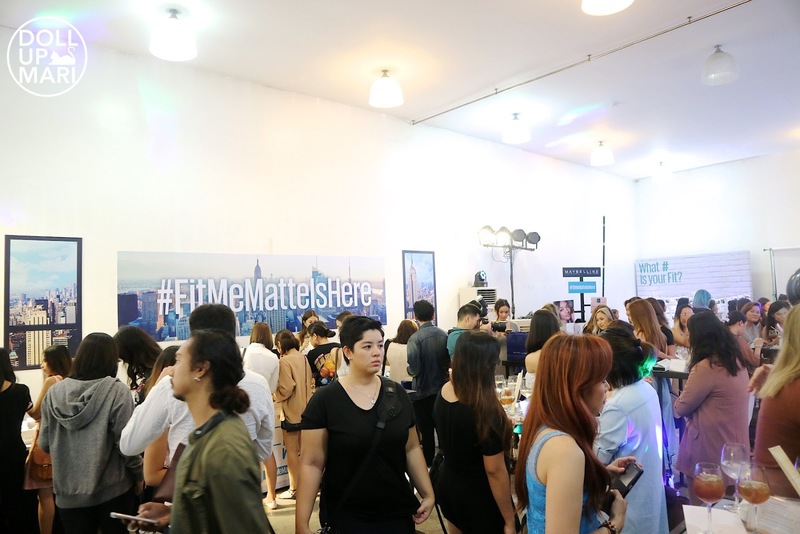 Companies usually will execute product launches based on region, and this is not necessarily the best way to go for the Philippines because we are not following the same trends as the rest of Asia most of the time. This phenomenon had frustrated me for years because companies were churning out products that weren't necessarily relevant to this market. 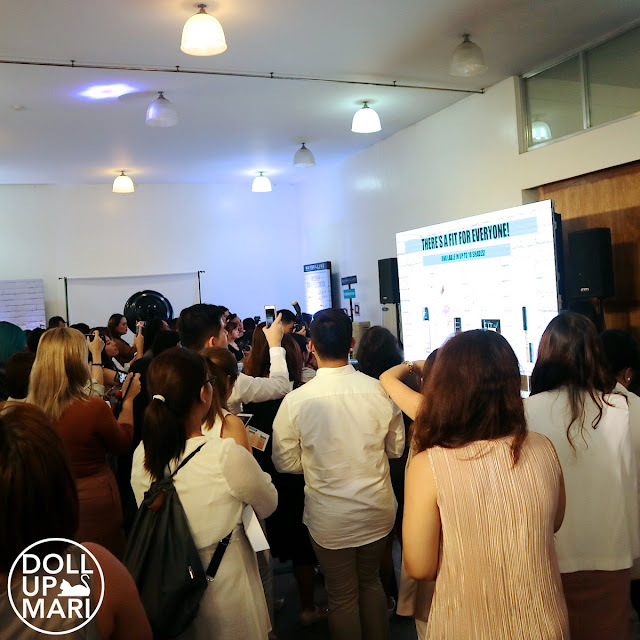 This is why I am so glad that regional offices have been giving Philippine brand managers more freedom in launches. Back then, everyone had to merely execute the Asian rollout. But nowadays, if you have the numbers to prove it, you can fight for your launches. 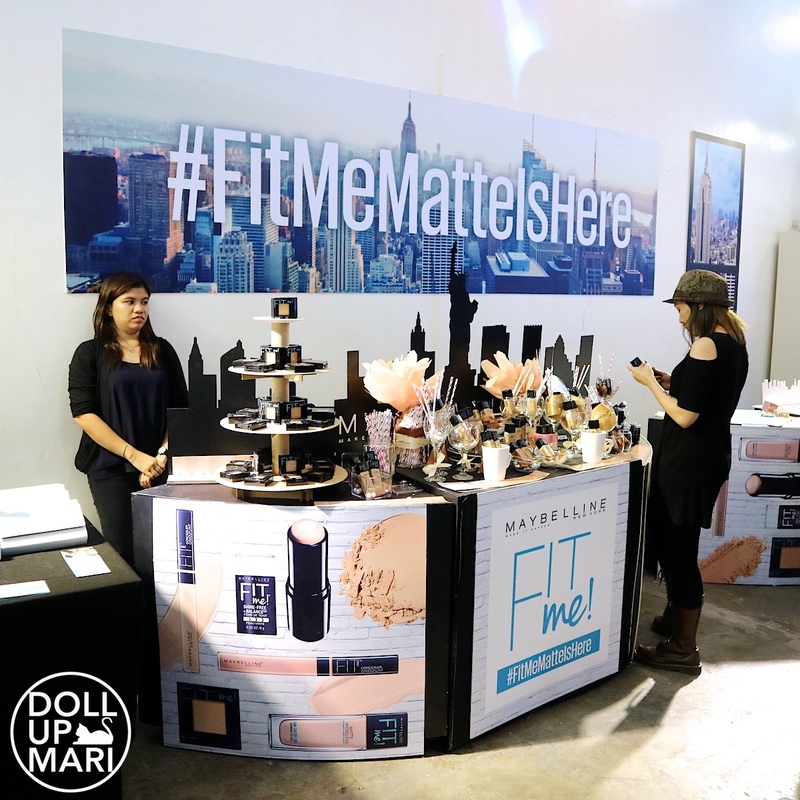 If you will remember the groundbreaking Creamy Mattes Brown Nudes collection, it is through the painstaking work of the marketing directors and brand managers of Maybelline to compile the data and prove to their bosses that it's worth it to bring it in. The spectacular sales only talks of one side, because on our side as consumers, if no mass drugstore brand ever took on that trend, a lot of consumers will not have been able to follow it. Maybelline is all about bringing trends from the catwalk to the sidewalk, so the current strategy I'm seeing is much more fitting. If this continues, they can finally take the spot as the #1 makeup brand in the country. I am so excited that they finally brought in FitMe! because people have been asking for it for sooo long. At the same time, people have had to take plenty of risks buying online because they couldn't really estimate their shade unlike if they went to a store. Not to mention that online prices of most stores nowadays are waaay higher than the actual SRP's of Maybelline Philippines. 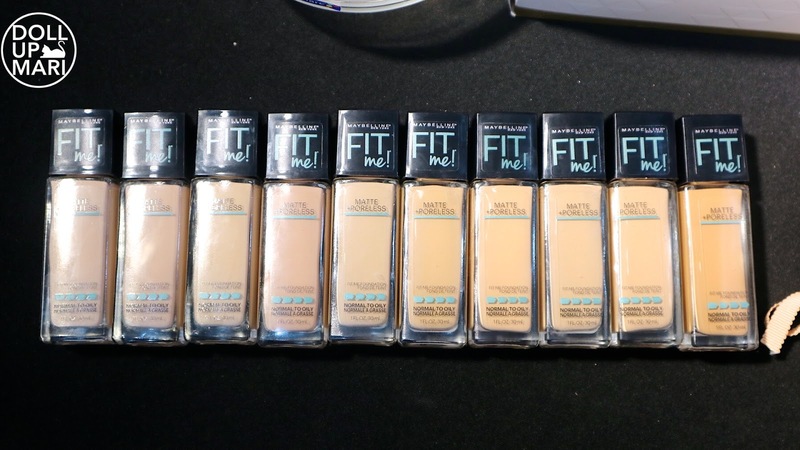 I remember spending even more money for my Maybelline FitMe! foundation which I bought online last year! Okaaaay going back, we all went to Sara Black's photography studio! I think even the team was amazed themselves as to how they transformed a gloomy, rainy afternoon into a posh escapade like how it'd be in Manhattan. Everyone was soooo excited to be doing the makeup buffet! The best thing about FitMe! is that they decided to bring in a very very healthy selection of shades so that more or less every Filipina can find her shade. They have 30 shades over 4 product formats, so I'm sooo sure there is something!!! If you look, you'll see Sara Black's equipment! That day we all had the privilege of having our photos taken by Sara herself! I'll be sharing photos once available!!! Okaaay here's a more realistic picture of the venue. Despite the rain and the very hidden address, it was jaaaam paaacked the whole time!!! Soooo many people came. 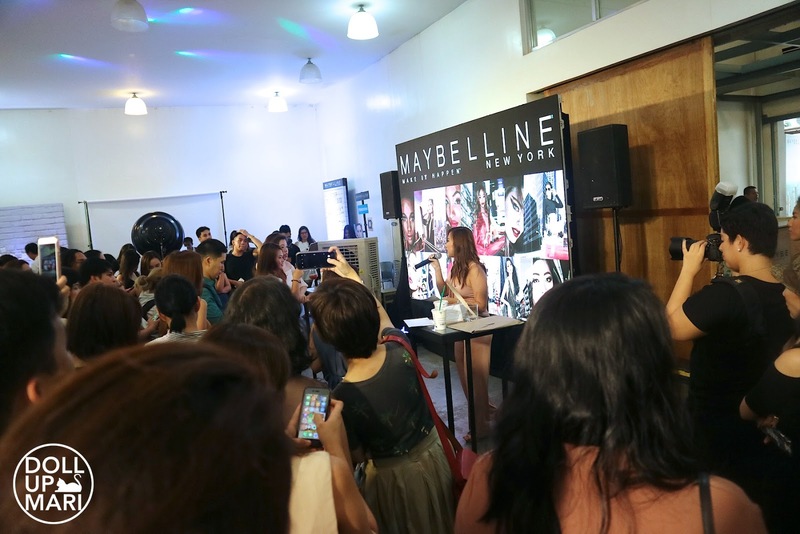 Maybelline events are usually packed, but this was a different level of packed. And yes! There's a fit for everyone! 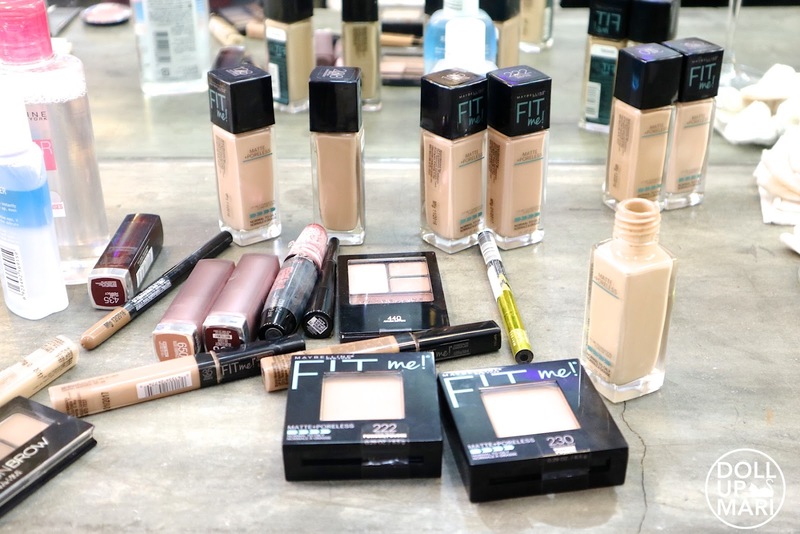 There's liquid foundation, stick foundation, concealer and powder to make a well rounded collection. 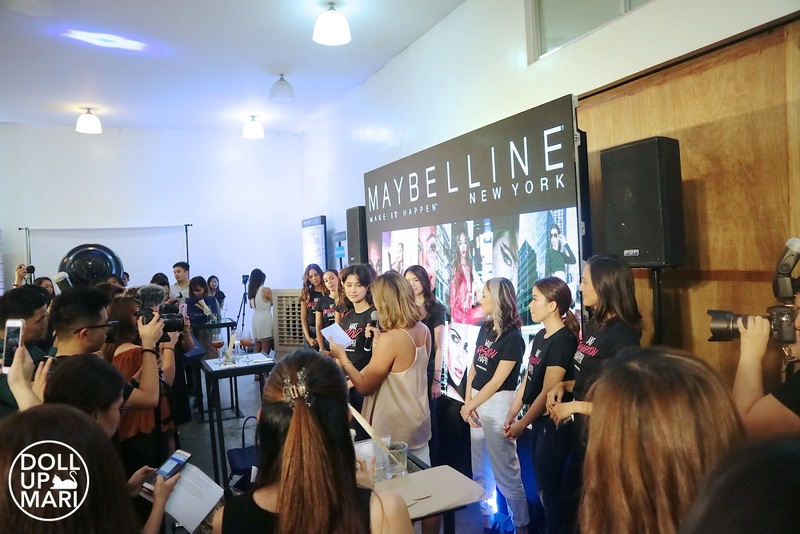 Each product format serves so much function in the whole system of Maybelline products in the Philippines. Bianca Sing, Jr. Product Manager for Face, was so excited to share this to everyone. 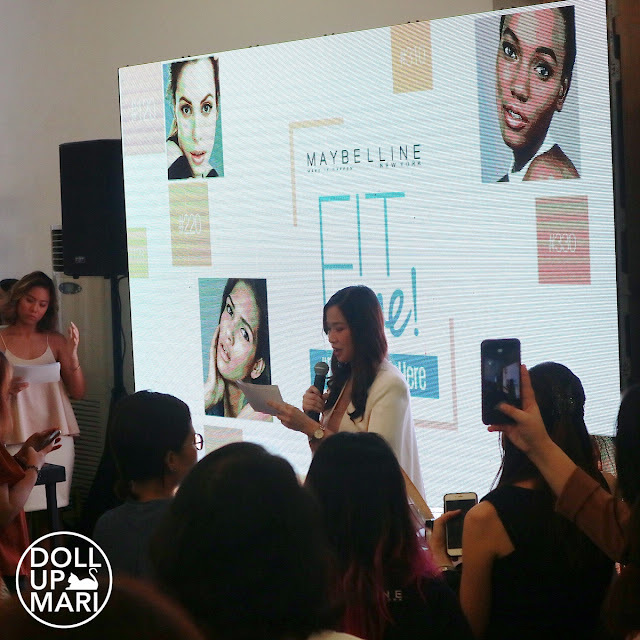 Cary Co, Marketing Director for Maybelline Philippines, welcomes everyone to the event. 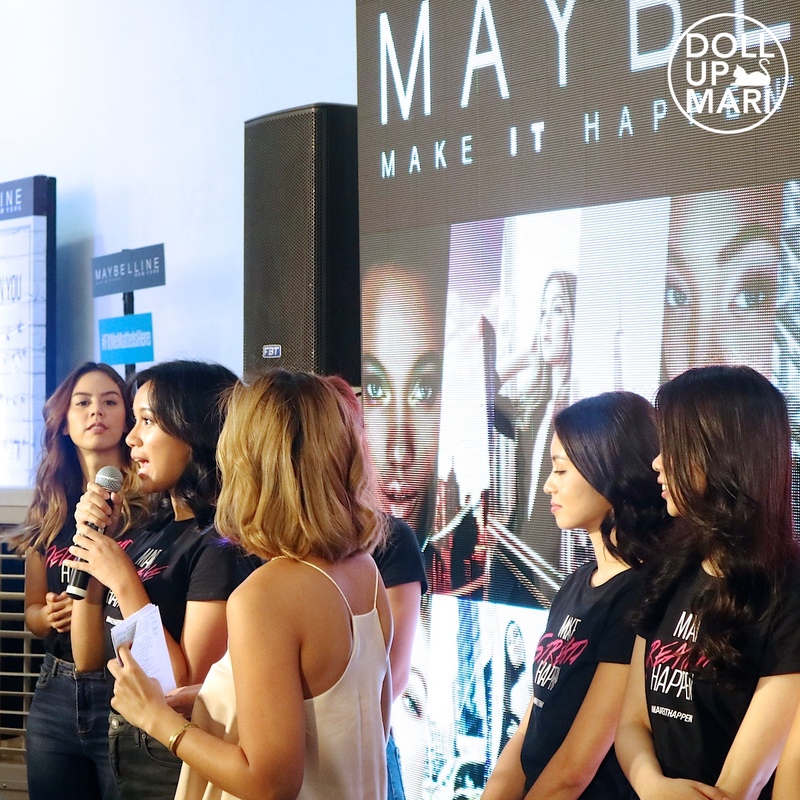 She is also very proud to present the official activities to kickoff the formal launch of the #MakeItHappen slogan. 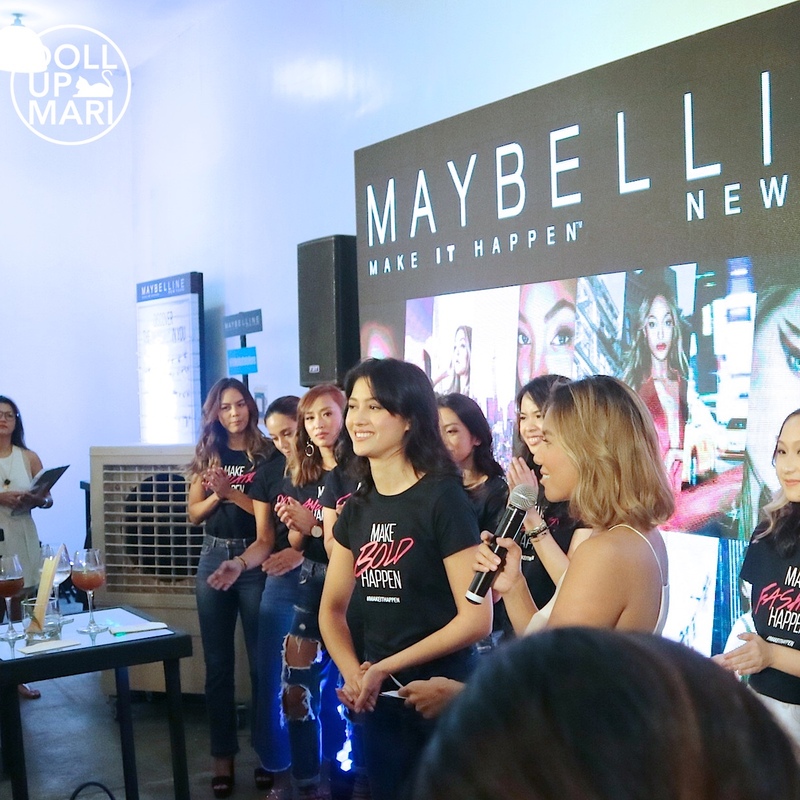 For the longest time, Maybelline's slogan was "Maybe she's born with it. Maybe it's Maybelline." and recently, they changed it to "Make It Happen" to fit the ways of the modern society. To add to that sentiment is Sandy Tiu, Product Manager for face. Continuing the story, Maybel Williams, founder of Maybelline, is a "maker" herself. The real story is that Maybel used soot on her eyes to get the attention of a man she liked. Her brother made a more stable formula of soot and Vaseline, and that was the first ever mascara formula. Maybel got the guy, and Maybelline was born. This is why they are super proud to unveil their 10 Filipina makers. 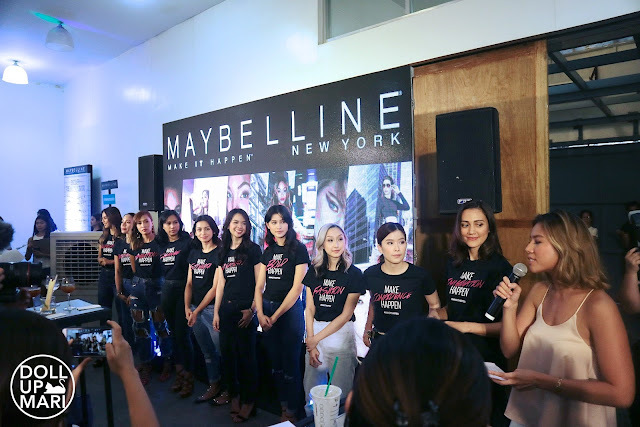 Maybelline chose 10 admirable Filipinas in different fields to be ambassadresses for the brand slogan. Of course, people (myself included) went craaazy over Maureen Wroblewitz. 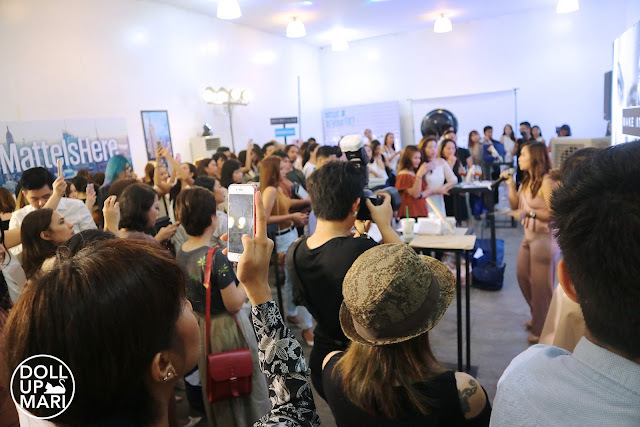 A lot of people in the crowd have been watching her AsNTM journey from the start, but I think everyone ended up knowing her because of her bullying videos going viral. 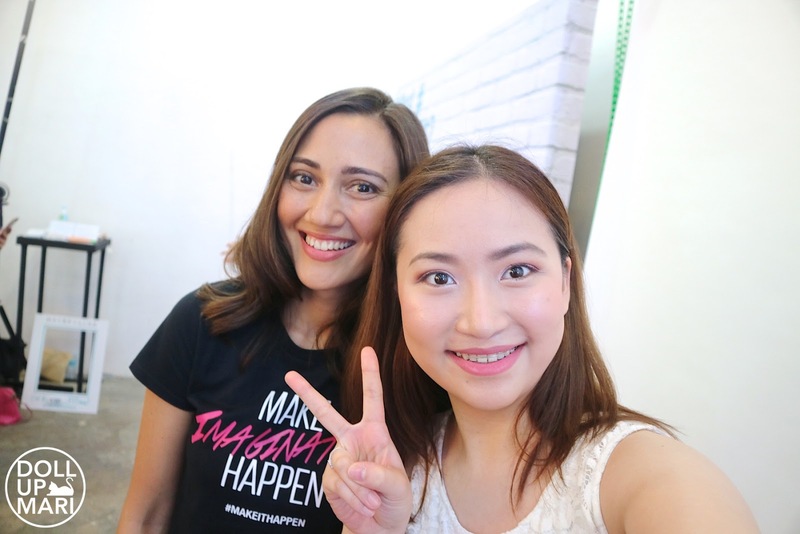 I'm sure you guys know that Maureen was bullied by a lot of her co participants on the show, one even being a fellow Filipina, and as such her story of resilience resonates to all of us. I watched this season from the beginning because we recently changed cable providers and we finally got Star World. I finally understood why people are crazily obsessed with the show!!! There's a lot of country pride that goes into it compared to other Top Model franchises. Gosh she is soooo pretty in person!!! It's no wonder why all her competitors were sooo insecure about her because she's so pretty that it's really hard to get a bad shot. She and Liza Soberano share the same talent of looking good no matter what the shot. Even when she's talking or even if it's a stolen shot, she never takes a bad photo. Now that's a model. My schoolmate is also here!!! 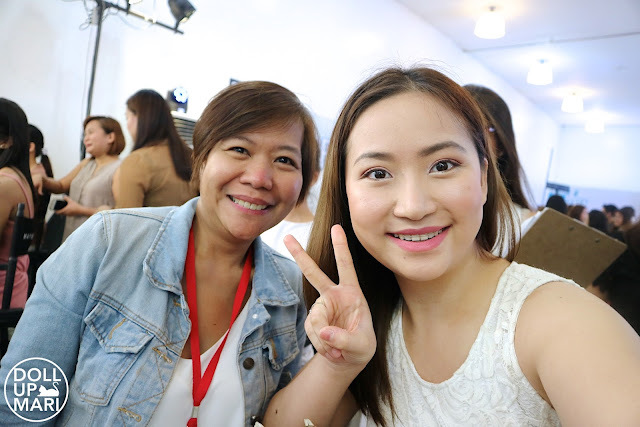 Arizza is a schoolmate from UP and a fellow Oblation Scholar. She is also an informal advocate for morena skin love, so it's just right that she got chosen for this. And here are the 10 ambassadresses. They come from various industries and fields, all fueled by self determination to make it happen. And wee, let's get onto the products!!! The FitMe! 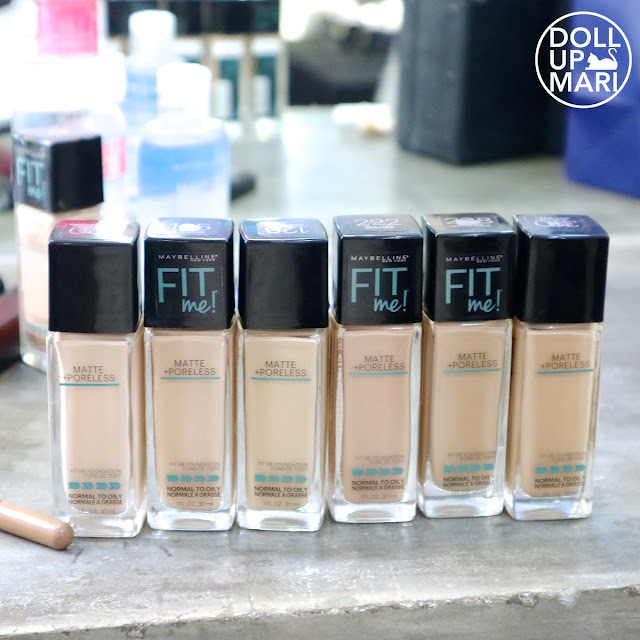 foundation is a great addition to the current Dream Velvet and Dream Satin collections, shades wise and texture wise. Dream Velvet has 5 shades while Dream Satin has 7 shades. Dream Velvet is mousse-ey while Dream Satin is the usual runny liquid foundation. FitMe! has 10 shades and sets on the wearer for a lightweight powder matte finish all day. FitMe! has comprably more coverage than Dream Velvet but less mask like effects compared to Dream Satin. And the 10 shades mean that if you ever see yourself not finding a shade in the other two collections, then maybe this is it. This retails for just Php399 a pop so this is definitely within the budgets of soo many people!!! FitMe! Powder is also something that I'm sooo excited about because I am much paler than the other existing pressed powders of Maybelline. 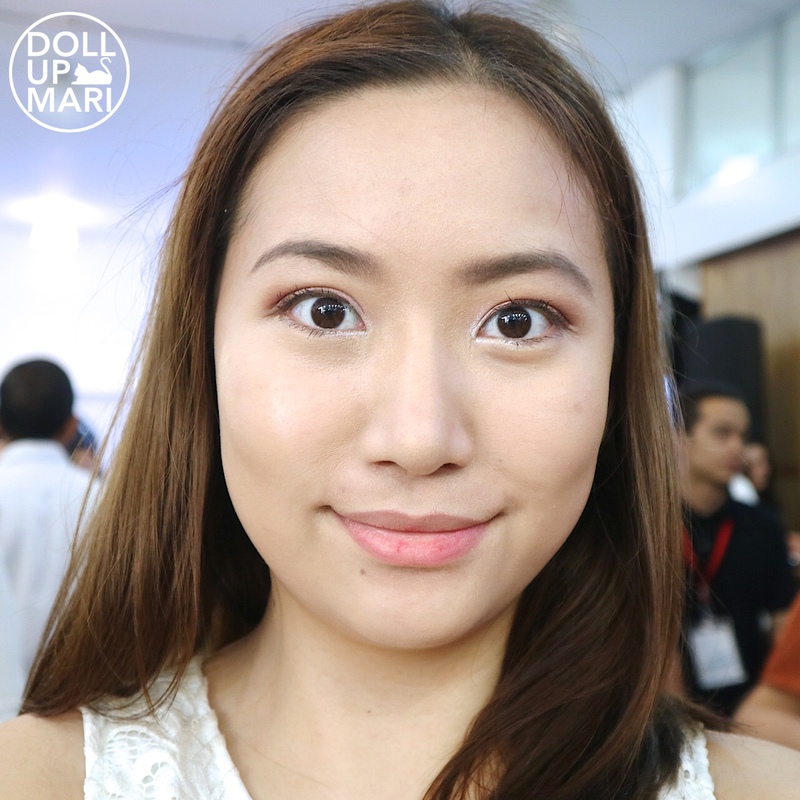 I am lighter than the lightest shade of Clear Smooth and White Superfresh, and my undertones are pinkish, not yellowish. 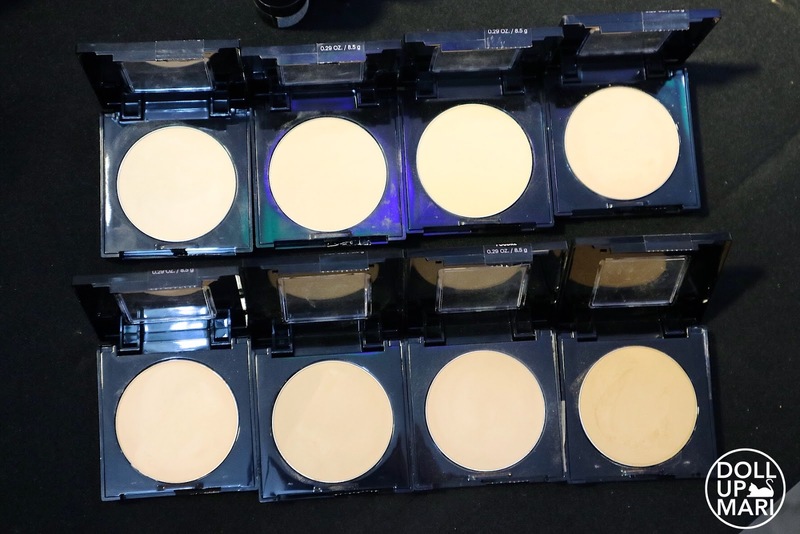 I like that they expanded their powder line and created different hues and undertones this time. Now I wish that the FitMe! loose powder is next because I love loose powder hahaha. This is a bit more expensive than the other powders at Php399, but if you have not found your Maybelline shade yet but like most of their powders, then this is for you. I see myself in that profile because I love Maybelline powders so much texture wise and oil control wise, but I know I'm settling for darker and yellower shades all the time.. I'm so happy there is finally something that fits me. I know it's not so apparent in this photo, and also because the powders apply a bit more sheerly compared to the other powders than Maybelline. 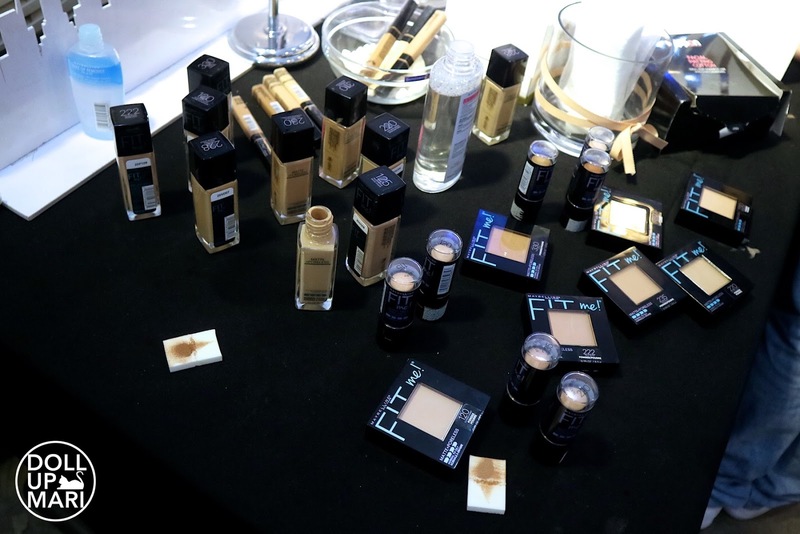 But I like that there is a real progression from light to deep so that those who are buying the darkest shades of the foundation releases also will have a powder to go with it. Under the current Maybelline collections, the lightest 2 and darkest 2 shades of this powder collection is not represented. 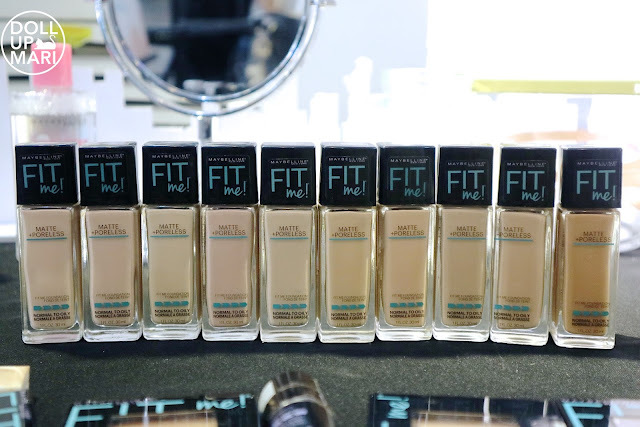 This is why by having this collection, marginalized people (aka ghosts like me and those with deep skintones) can have a genuinely fitting powder. FitMe! 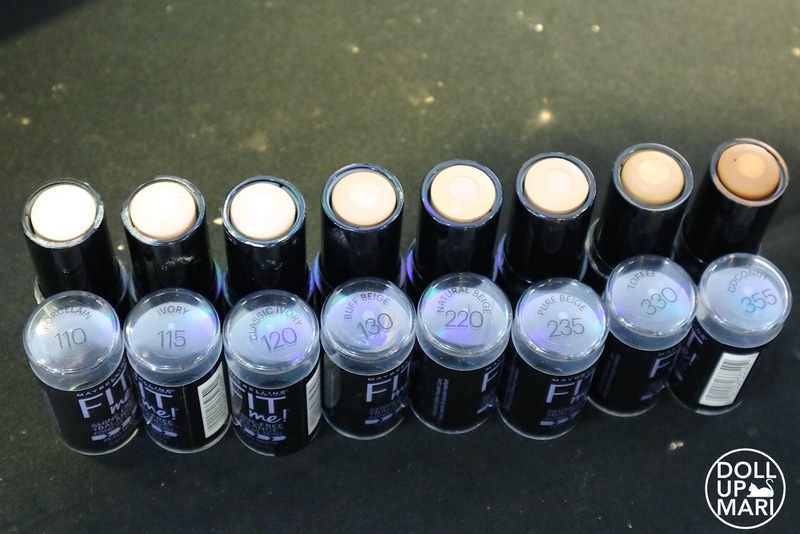 Foundation Sticks are sure to make a lot of more mature customers sooo happy because a lot of mature customers still aren't super used to liquid foundation till now. 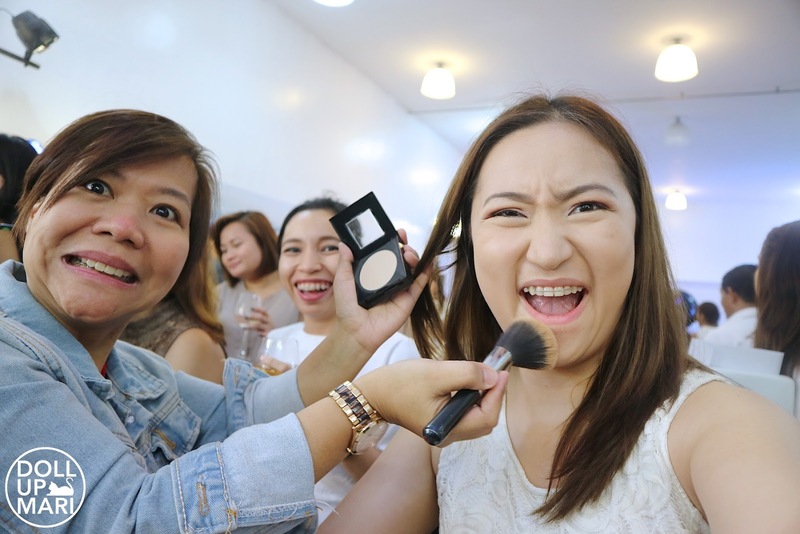 But at the same time, the Philippines is a 'plakado' obsessed country with all the US trends, and as such, we need heavier coverage in this era for all our impactful makeup looks. I also like that they have something like this on the go because it can be quite cumbersome to bring along giant glass bottles of liquid foundation. This has plastic packaging and is quite compact, and the stick format means that this is travel (aka airport security) friendly, too. Each stick has a powder core so that it's fresh and still relatively lightweight to the wearer, and matte all day of course. This is what differentiates this from all other stick foundations done in the past. As for the concealer, I know y'all already had a taste of the FitMe! collection when they had a soft launch of the concealer late last year. Their concealer is so affordable at Php199 because it acts like a lot of its more expensive counterparts. I have yet to review Maybelline's Age Rewind concealer, but I think that this in general is a good collection, too. This comes in shades 20, 25, 30, and 35. This may be good for contour for some, although I think that their existing V-Face line would be more appropriate for that. This concealer sets in, and when it sets, it doesn't move. 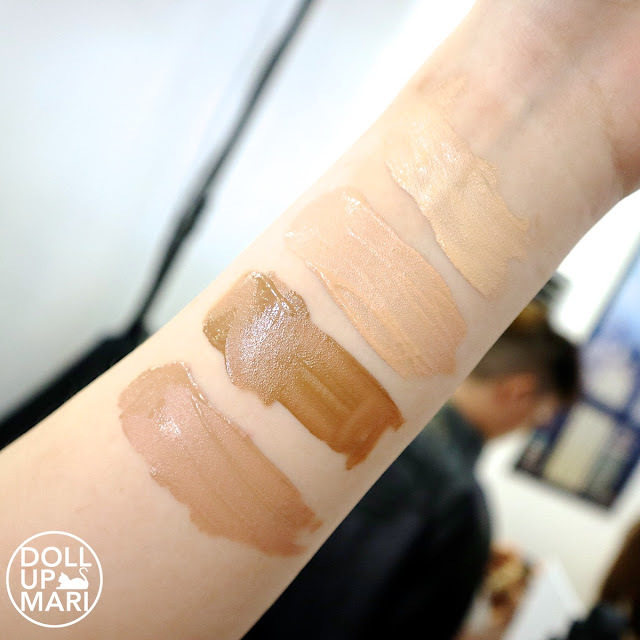 We want concealers to last all day so that's a good thing, but contour wise, it's not so easy to blend it in once left on the skin for quite some time. And this is a photo of the battlefield. This was the tester table, and as such, people were swatching like crazy. I had to patiently wait for most people to go home before I could swatch in peace. 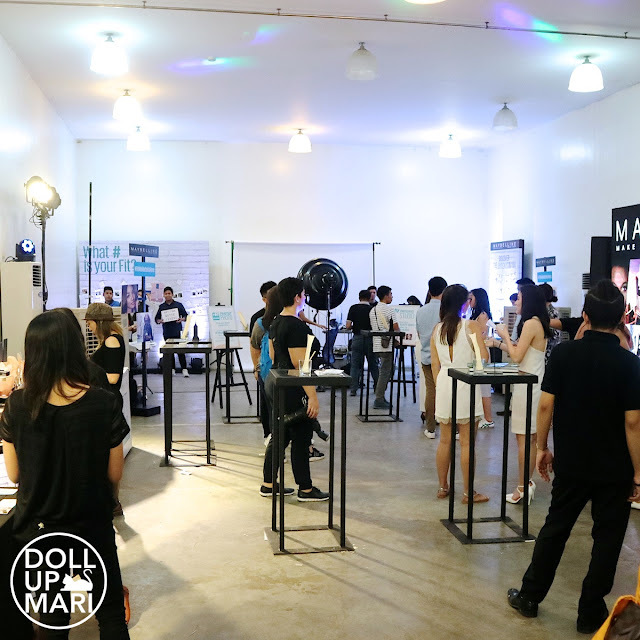 And of course, part of the event is trying the products ourselves. They had makeup artists come over so we can find our fit. I immediately asked for the lightest shades to be used on me wahaha. 120 is the lightest shade they brought in for liquid foundation, but I use 112 at home. 112 is a bit too light, but I think my perfect shade is 115. I'm not worried because when I'm at home I'll mix 112 and 120 to get the perfect shade for me. And thankfully, they brought in 110 for the stick foundation so I don't think I need to adjust for that! This is me after having 120 foundation, 20 concealer, and 120 powder used on me. Weeeeell it's a good fit, though not 100%. I'm not bothered because I'm marginalized. I'm so pale that when people see me they often comment on how pale I am. As such, I feel that 120 is a shade most people can use already. Also, while it's not a perfect match, it's already 85-90% close, so I'm thankful for that. Most of the time, I only find shades that are 40-60% close and I often have to buy my shades abroad. So for something that can be picked up locally, this is already close. But since a lot of people are hooked up on Glutatione, perhaps if the market research is good, it's not impossible for them to bring in more shades. Makeup artist and I having a blast. I guess she got tired of how much stories I had to share hahaha. And yes that's Kaycee photobombing us hahaha. I already came to the event with full makeup, so it was more of a replacement of face makeup. FitMe! is known for being lightweight and for having medium coverage, so it's meant to be natural and not overwhelming for most makeup beginners. This is why it looks like I don't have much makeup on. And here's a proper photo with her after the session. I requested for her to mix Powder Mattes Barely There and Creamy Mattes Touch of Spice and I like the results. We no longer did contouring because I feel that I'm just too pale for the contour products on hand that day. I use V-Face duo powder at home and just dust it on very very lightly nowadays because I feel like we're moving on from contouring to strobing nowadays. And wee, here's a photo of me with Sara Black! I'm sooo excited to see my portraits!!! I will of course be back within the month for the reviews, but as I am back in school right now, please forgive me if the pacing may not be as fast as what I would want. 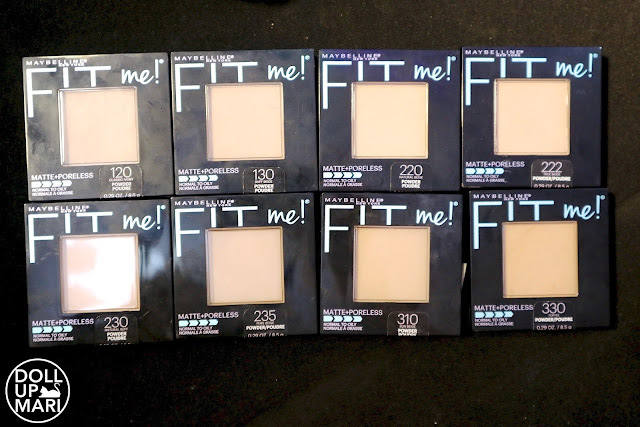 So yaaaay, hurry to your nearest Maybelline counter to find your fit! 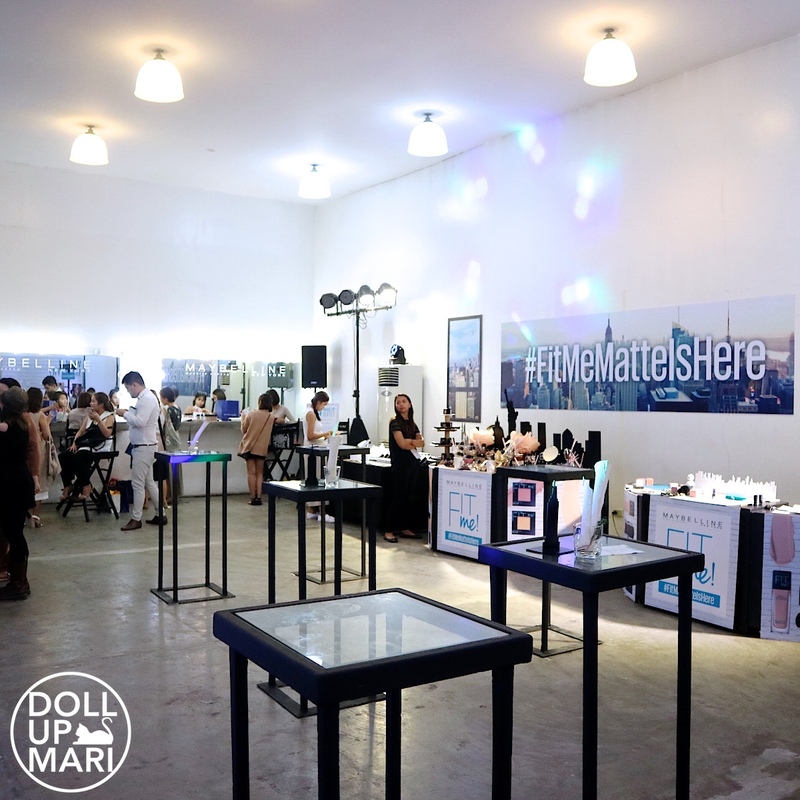 Ang cute nyo dun sa isang pictures ate Mari :) So happy din ako finally matatry kona tong foundie na po na ito :) Walang nang problema bumili at sa shades hihi :) Ano po kaya mas okay eto or ung pro matte ng loreal? 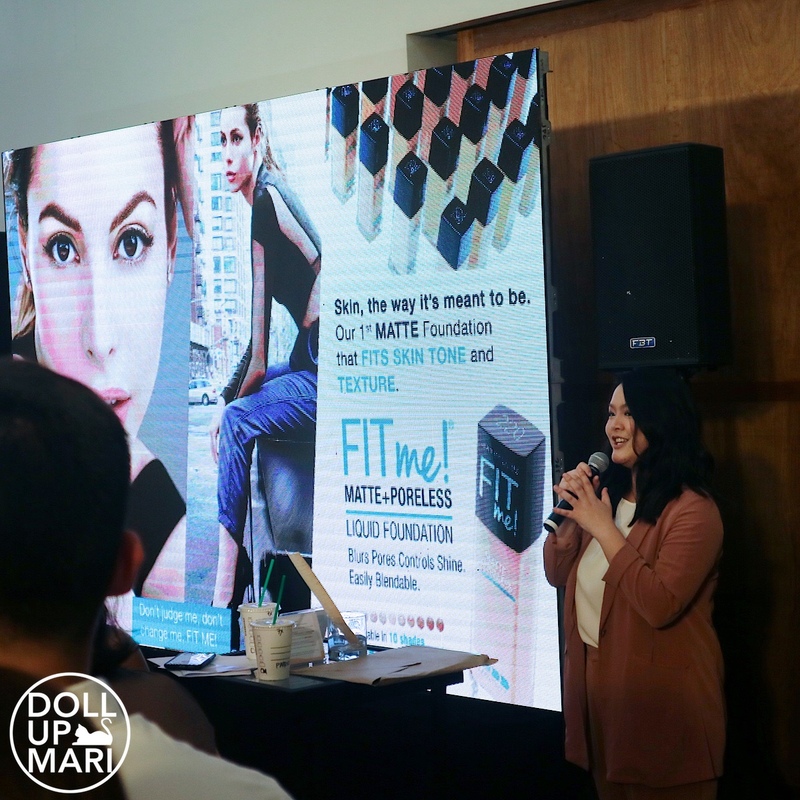 I was really excited when I saw IG stories of you and other bloggers featuring the launch of Fit Me. Atlast this already available in the Philippines.